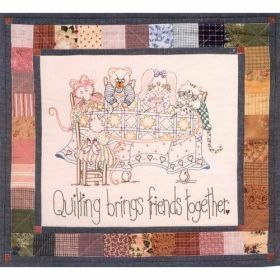 "Quilting brings friends together" as depicted by the quiltmaker mice who have gathered their friends together - namely a bear, a bunny & a cat - to create their own Friendship Quilt. Measuring 23" x 25", this delightful stitchery design is surrounded by a patchwork border that's machine quilted. All patterns include a thread chart & use four basic stitches: Backstitch, Running Stitch, French Knot & Lazy Daisy. Makes a wonderful gift for friends & fellow quilters! Designed by Dougal Ann Walker.